Watched two great movies based on historic events over the past two weeks: Frost/Nixon and Milk. I would recommend both of these, for different reasons. Frost/Nixon is basically a political suspense drama written around the creation of the well-known series of interviews with Richard Nixon after his resignation over Watergate, led by David Frost. Despite knowing before even entering the movie theater that the interviews will happen and will be a success, the film manages to grip and never let go of you until the closing titles. 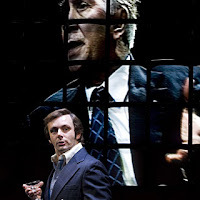 A major part of the magic is the magnificent acting by the two lead performers: Michael Sheen and Frank Langella. I suspect that a lot of this is due to the fact that both these actors were part of the original stage cast and so could explore and refine their characters to perfection. Even for non-history-majors (unlike yours truly) it is a movie well worth seeing. Milk I just watched today, in a well-filled matinee screening at a local program theater. It is about eight final years of life of Harvey Milk, gay rights activist and the first openly gay man to be elected to public office in California. While it runs in eight theaters in DC metro area, ranging from smallish ones to mainstream multiplexes like AMC and Regal, here in the Triangle, it only shows in one "alternative" theater in Raleigh, Durham, and Chapel Hill each. Regardless, a 30-minute drive out to see the film was well worth my while. Good acting by the cast mostly unknown to me, barring the brilliant Mr Penn, of course. Solid screenplay. A captivating story. 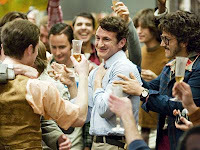 While Frost/Nixon approaches history from a political thriller angle, Milk focuses on the human aspect of the fight for gay rights in 1970s. Art lovers might appreciate the fact that Jeff Koons plays a supporting role in the movie. If I had to pick one of the two over the other, I would pick Frost, just because I tend to favor thrillers over other types of drama. Both films are equally great and nuanced and all the good things you'd expect in a good movie. Now off to the box office!